« Havana Brown Cat – Very Brown Cat! The Himalayan Cat can trace its ancestry to the beloved Persian Cat. It is, in fact, almost identical to the Persian cat with the exception of blue eyes and point coloration. The Persian cat was cross bred with the Siamese cat and the resulting offspring were the founding line of Himalayan cats. There are three different types of Himalayan cats based on their facial features. Show cats usually have very large eyes with the nose right in between. Breeder or pet Himalayan cats may have longer muzzles. The third type may have longer muzzles as well as smaller eyes than show cats. Not unlike Persian cats, the Himalayan cats have a round body with short legs. The Himalayan cats have very long fur which is usually white or cream in color. Their point coloration may be of a variety of colors like seal, blue, lilac, chocolate, red and cream. Himalayan Cats are considered to be intelligent, playful and sweet tempered. They are also very social. They love to play fetch or amuse themselves with kitty toys. They love human company and like to be petted and groomed frequently. 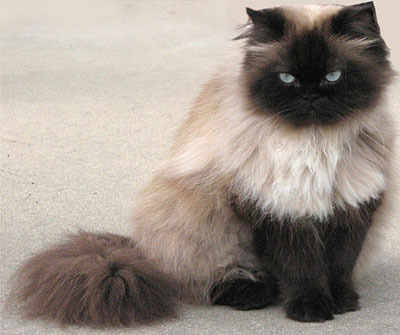 Since the Himalayan cat is a long haired breed, it needs to be brushed daily and bathed weekly. If you want to enter your Himalayan cat into a show, you may even have to bathe it daily, depending on its coat. They may be prone to Polycystic Kidney Disease due to their Persian ancestry. I have a Himalayan cat. he is awsum has a very big personality. I have had my hymalia siamese cat for 17 yrs now. she is very spoiled but a great delight to have around. Does anyone know if their in the 18-20 year life range? Yes, they actually do. My grandmother had a persian, and she lived for exactly 18 years. If my grandmother had not died, I believe her cat would have leved longer as well. But because the ancestry is persian, they have long lives, however they are VERY prone kidney disease and lukemia. I have to have my himalayan tested for lukemia as my vet recommnded. I found mine at the animal rescue, it was so sad, he must havre been abused, but now Max is healthy, happy and I expect my himalayan to live for a long time. My “Frankline” was with me for 24 years. She was an indoor cat with papers, although she was not a “show” cat she very well could have been. She was a great companion and I miss her terribly. It’s time to find another “Frankie “to love and care for. Himalayans are an incredible cat. we all feel a shame on the cats because they are poor and beautiful and some people are allergic to them. I got my first munchkin Himalayan and he is everything they say they are. He doesn’t have the flat face but his nose is short. It took me 3 years to find the right one, but Milo(short for “my low kitty because his front legs are so low to the ground) was worth the wait. Please don’t anyone just go get one without doing some research and you will end up with what you want in a cat. These cats are absolutely the most amazing cat a person can have. They are sweet, gentle and fun loving. They are very social with their owners, but with new people they tend to be shy. My bf bought me my first one for xmas last year, he is a male. He just turned a year old in November. He is a big guy at 17 pounds. We got our second one about a 4 months ago. She is light weight and much smaller than he was at her age. They both have their seperate “catnalities” He is very independent and loves to play hide and seek and different games like that. He prefers to come to us when he wants the love and affection. Her on the other hand is a ball of love and joy. She always wants the attention. She follows me around everywhere I go and always wants to be on my lap or next to me. These cats have become my life. I would have a house full if it was legal. They are calm and warm and they purr like no other cat. I have had many many cats throughout my life and none of them will EVER compare to these sweet fluffy cats. She loves to be brushes. He doesnt like it so much, but he knows it needs to be done. His back end area is the area he hates the most. No matter how annoyed or mad he might get while trying to get a knot out or me brushing him lots, these cats will never bit or scratch you. They have such amazing temperments. I have given him several baths, though he meows a deep growling meow, he has never bitten or scratch me EVER. Both cats have been around kids and “put up” with them well. (pulling, carrying, teasing them). Both of my cats came from the same breeder so they are sister and brother but obviously from a seperate batch. They love each other so much and are very playful with each other. They snuggle together, and clean each other. These truly are the most amazing, most beautiful and most precious cats anyone could EVER EVER have. We love them so much, so do our friends and family. Bfs sister loves them so much that we are surprising her this year for xmas and getting her one. CHEERS to all the Himmy lovers our there. Where can I buy one of these kitten’s? is there a website with different breeders in it? nicole where r you from? Err how do you force the siamese and the persian to “do the deed” o-o ? We have a gorgeous Himalayan called Mochacino, he is a indoor cat,he sleeps withus at night,we love him very much. I have a male Himalayan named “Pretty Boy” that I was given when I moved to my 60 acre ranch in Colorado. He loves to talk to you and is more than affectionate he will sit on your lap for hours to be petted and loves to be groomed!!! He likes being rocked and is soooo spoiled!!! The only thing that is hard to keep up with is he has been completely kept as a house cat and he loves to go out doors and hunt for mice and girlfriends lol!! He gets his hair tangled up alot outdoors and it is alot of work to keep it combed. There seems to be an abundance of Kittens starting to grow around here. They are beatiful even though the mama is a white cat with a couple of light tan rings on her tail and ears. The babies are white with aome of his marking and his beautiful blue eyes. “Pretty Boy” is very smart though he is very attentive to the kittens and he stays with them and watches them close when the mama cat leaves for a while he has taught all of them how to use the liter box even, I could never ask for a better pet or friend and he sleeps with me as well as my Boxer named “Baby Girl” and my Chihuahua named “princess” they are quite the group! But if you have time for an animal and like cats this is a wonderful friend and companion to have!!!! Oh and they will purrrrrrrrr you to sleep like a lullaby. Be careful where you go to find one of these kittens or cats you do not want to go to a a kitty mill either and it is best to find one around your area if possible so you can see the surounding and how they are being taken care of and if they have papers also you will know what the bloodline is if you want to do shows. I have a sweet and beautiful Seal Point Himalayan named Jameson. He is my joy. Love him so much. My Sweetie passed today. She was 12. I have cried a lot. I tried to save her but she had severe anemia. She was a chocolate himi.